Governor Rochas Okorocha of Imo state on Thursday met with President Muhammadu Buhari and declared afterwards that the ruling All Progressive Congress (APC) will lose five million voters as a result of the crises besetting the party. A fuming Okorocha told State House corespondents that the National Chairman of the party, Comrade Adams Oshiomhole does not have the president’s support to mishandle issues in the party. He said the party boss has no right to substitute Uche Nwosu with Hope Uzodinma as the gubernatorial candidate of the party in Imo state. He also said the National Leader of the party, Asiwaju Bola Tinubu was ill-informed over the crisis following his reported support for Oshiomhole. But the Imo Governor who noted with dismay that the party is contemplating undemocratic measures in determining the governorship candidate in his State, even after a candidate has been duly elected. He enjoined the National Chairman to forward Nwosu’s name as the governorship candidate and jettison sentiments promoted by those that do not mean well for the party. 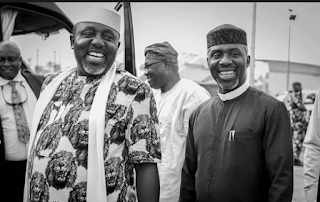 Okorocha insisted that Oshiomhole and members of the National Working Committee of the party owe it as an obligation to defend the integrity of the party, which he said distinguishes it from other political parties. According to him, Oshiomhole was elected as the National Chairman of the party as a result of his track record of honesty and integrity, which he adduced were and are still his highest selling points.